Welcome to CX Insider, SaleMove’s podcast on Customer Experience. While the name of our podcast has changed for 2018, the thought provoking conversations we’ll be having with customer experience thought leaders have not. 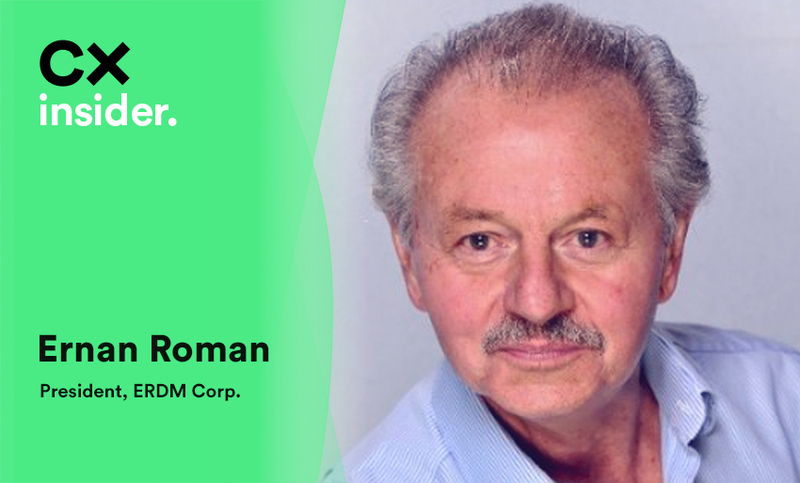 On this episode of CX Insider, our co-founder and CEO, Dan Michaeli, sits down with Ernan Roman, the President at ERDM Corp, a customer experience agency that specializes in Voice of Customer Relationship Research to discuss how VOC helped MassMutual see a 5X increase in their customer response rate. ERDM Corp focuses on conducting deep, qualitative VOC research in order to understand the CX expectations of their clients’ customers. The information collected is then used to develop strategies and action plans for their clients that are scalable, sustainable, and replicable. ERDM Corp was inducted into the DMA Marketing Hall of Fame based on the results of their VOC research strategies for large companies such as Microsoft, MassMutual, IBM and QVC. When asked to define customer experience, Ernan said the definition has evolved and continues to evolve as they conduct interviews with customers, but from a VOC perspective, CX must be a holistic, company wide, integrated obsession with improving the customer journey across the entire life cycle of the customer. In order for this to be effective, the process must be scalable, sustainable and replicable with technology being the last consideration, not the first. Dan and Ernan then dove into a conversation about voice of the customer, and Ernan explained that VOC can be described as any vehicle that is helping or educating a company in regards to the customers ongoing needs or expectations, and how well the company is doing in meeting them. Back in the day, this was measured quantitatively using NPS/CSAT/CES scores, but as time has gone on and the customer experience has evolved, VOC has taken a qualitative approach. Voice of the customer focuses more on the ‘why’ and ‘how’, like ‘why is a customer dissatisfied with their experience’ and ‘how should we work to improve your experience’. ERMP Corp looks into why a company either is or is not meeting a customer’s expectations and how the customer would like the situation to be remedied. From there, Ernan dives into how he makes sense of all this qualitative data, he talks about a variety of technologies they have used over the years that scan through conversations they have with customers to look for certain patterns in conversation or a word that is used the most frequently. However, they found that none of these programs were able to provide a deep understanding of how a customer is feeling and what they want or need in order to improve their experience. When they are conducting in-depth interviews with customers, they try to limit the amount of structured questions they ask so customers can dive deep into the topics that resonate best with them. This means each interview they conduct is different based on each individual customer’s own experiences because this generates the most useful output. From there, ERDM Corp goes through each hour long interview extensively to pull out key information, insights, threats or necessary actions their clients should be taking. One of Ernan’s most notable clients is MassMutual, one of the oldest financial institutions in America that has a reputation for financial stability, profitability and social responsibility. ERDM Corp has worked with MassMutual for over 5 years on a number of VOC campaigns, on both the B2B and B2C sides. MassMutual sought out ERDM Corp for help when they realized their traditional methods of personalization and personas were not driving the levels of engagement and responsiveness they wanted in regards to 401k plans. After conducting extensive research, they found that people (particularly millennials who are becoming an increasingly large part of the workforce) were looking for very human need based personalization. With the help of Ernan and his team, MassMutual was able to ask their customers all the right questions in order to tailor content, writing and imagery for each persona that was identified in ERDM Corp’s research. By doing so, MassMutual was able to achieve a 5X increase in customer responsiveness, tracked over millions of customers. When asked what the future of customer experience looks like, Ernan said that it will revolve around using technology, like artificial intelligence (AI), to improve the human experience and be subservient by blending the best of what can be learned from AI with the deeper understanding of human data. To learn more about voice of the customer and its influence on MassMutual, check out our full podcast here!